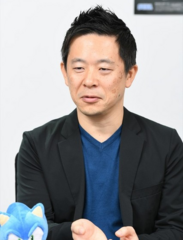 Shun Nakamura (中村 俊) joined Sega in 1997 and was attached to the CS3 R&D division as a planner. After participating in the Sega Saturn title Sonic R and Dreamcast title Sonic Adventure, his directorial debut was the 1999 arcade game Samba de Amigo. His other works include Billy Hatcher and the Giant Egg, Sonic the Hedgehog and Rhythm Thief & the Emperor's Treasure, all of which he served as director.